The organizing of the Boston Social Forum (BSF) began with a humble proposition: we do not have the answers, [but] if the right people come together in the right way, they wil develop at least some of the answers, and perhaps even a new societal vision. And certainly, they will build on existing organizing projects and create new ones. With this in mind, the Boston Social Forum welcomes both you and the World Social Forum (WSF) process. 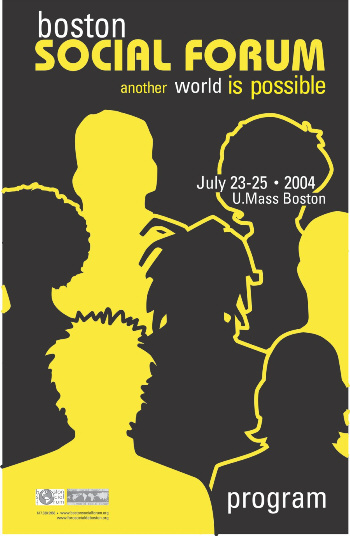 Following the model of the WSF, the Boston Social Forum is not a platform, not an organization, but an ”open space… a meeting place for reflective thinking, democratic debate of ideas, formulation of proposals, free exchange of experiences and interlinking for effective action by groups and movements…committed to building a society centered on the human person.” While the Forum will issue no final statements or declarations binding on all its participants, it will doubtlessly spawn many projects and new relationships. This is the case with the run-up to the forum, with events involving thousands and bringing personalities as diverse as Felix Arroyo, Michelle Shocked, Diane Dujon, Howard Zinn, Noam Chomsky, and Chuck Turner, and cultural moments including showings of The Corporation and Fahrenheit 911 and a 24-hour 4th of July “Celebration of Interdependence” music-a-thon. Organizing stretched from the Socialist Scholars Conference in New York through to festivals in Maine, Rhode Island and New Hampshire. Social Forums from as far afield as Turkey and Brazil sent their greetings and best wishes for successful forum on American soil. As with other social forums, a majority of the nearly 600 events listed in this program are self-proposed—autonomously developed by their sponsoring organizations and not coordinated by any central body. Nonetheless, the Forum also features a number of collaborations and conferences that developed as part of the BSF-planning process: an Active Arts Youth Conference, organized by hip-hop activists; an International Peace Conference, drawing activists, parliamentarians and organizers from Africa, Asia, Europe, and Latin America; three subject-area tracks—economy, immigration, and education—developed into full-fledged conferences (one with a bold and assertive title, ”Other Economies Are Possible!“). Also organized are conferences dealing with international crisis areas like Haiti and Palestine, and the Women's Web, exploring ideas from a woman's point of view. The major convocations of the Boston Social Forum will feature simultaneous translation into Spanish, ASL, and possibly other languages. Close attention has been paid to making the Forum compliant with the Americans with Disabilities Act. Future forums, however, will have to improve accessibility to people speaking languages other than English. The events, organized into more than thirty subject areas, do not take place in a vacuum; instead, they address real problems associated with the neo-liberal package of deregulation and privatization, destruction of the public sector, punitive welfare and justice policies, and corporate globalization. The people of New England attending the forum will find that the real-life struggles they face—including the bankrupting of local government, outsourcing of their jobs, privatizing of their water and power, denial of their civil, labor and human rights—are reflected in the programming. They will also find many approaches to challenging the ultraaggressive military posture of the United States, as it continues projects in Iraq and the greater Middle East, subverting democratically-elected governments in Venezuela and Haiti, all while averting its eye to ongoing genocides in Sudan and elsewhere. Where the World Social Forum began as a positive response in the Global South (held Porto Alegre, Brazil) to the gathering of world capitalists in the World Economic Forum (held in Davos, Switzerland), the Boston Social Forum sharpens the contrast between the polar parties of Davos and Porto Alegre, held as it is on a public university, bringing together labor, peace activists, immigrants, people of color, environmentalists and intellectuals, all at the same time that one-half of the US power structure [the Democratic Party's National Convention] gathers in the same city, Boston. Speaking truth to power, the forum will demonstrate that another world is possible from within the proverbial belly of the beast. Another world is possible!